Covers the theory of electromagnetic fields in matter, and the theory of macroscopic electric and magnetic properties of matter. 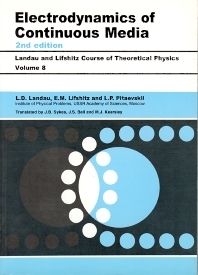 There is a considerable amount of new material particularly on the theory of the magnetic properties of matter and the theory of optical phenomena with new chapters on spatial dispersion and non-linear optics. For undergraduates, postgraduates and research workers in theoretical physics and scientists interested in electrodynamics. Electrostatics of conductors; Static magnetic field; Superconductivity; The propagation of electromagnetic waves; Spatial dispersion; Diffraction of X rays in crystals.